This was an odd story. The premise is your typical space adventure. 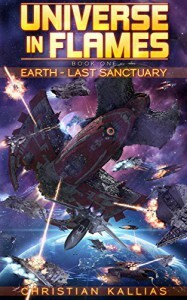 Bad guys trying to rule the universe; a group of rebels trying to stop them; and Earth caught in the middle. The fight scenarios were done well and fun to read. You could almost imagine yourself in the space fighter spinning and shooting. It was fun. Then you bring in a goddess and the story just falls. I almost put it down then but continued on because the fighting was enjoyable and almost made up for the lost Olympian gods. I felt the author over simplified the story a bit and well dumbed it down. Perhaps the intended audience is much younger but it just didn't seem to flow well. I really doubt I will hunt down the rest of the series. But if you like simple action with a bit of love and gods thrown in then check it out. There are four books in the series.